A really quick recipe that can be rustled up from storecupobard ingredients. Try adding some chopped roasted pepper for an extra treat. Cook double and eat the remaining sauce with fish or chicken. 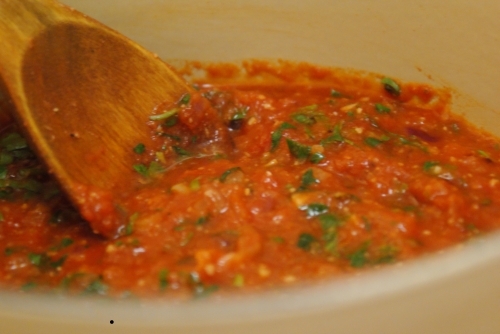 Heat the olive oil in a saucepan and fry the onions, garlic and chilli over a low heat until really soft, add the chopped tomatoes, season well and simmer for 10mins, you may need to add a pinch of sugar if they're a bit sour. Now stir in the ground almonds and you're ready to serve. Eat with lots of spaghetti. Want to eat a bit healthier?